With up to 80 electronic control units in luxury cars, soon 1 GB of software and many non-functional requirements the increasing amount of electronic functionality represents a big challenge for the automotive industry. In today's development processes of embedded systems, numerous models are utilized in parallel to describe one target system. In order to allow a later integration of the different results of this process many consistency relations have to be obeyed. 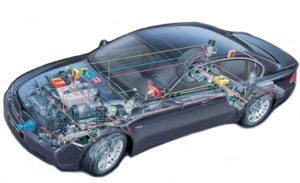 In an effort to tackle the arising problems in automotive electronics the international AUTOSAR consortium, formed by OEMs, suppliers and tool developers, tries to develop an open standard for automotive E/E-architectures, easing systems integration and deployment of standard components. As one of the most innovative car manufacturers in Germany, BMW Group took over the lead in the consortium and strives for a continuous model-driven development process of automotive electric/electronic systems based on the evolving AUTOSAR standard. In this process architectural models of functions, software and hardware play a prominent role. i-caramba (Integrated Component ARchitecture for Automotive eMBedded Applications) is a cooperative project of BMW Group and the Department of Computer Science 3 (Software Engineering) at Aachen University of Technolgy, which aims at supporting the engineers in developing integrated models of functions, hardware and software by providing concepts and tools. Tools are developed for editing models separately as well as editors for mappings between models, e.g. the deployment of software components to hardware units. All tools are based on the i-caramba meta-model kernel. There are many interesting topics for diploma theses available. A project in cooperation with BMW Group, Munich. "Refactoring function nets extracted from signal lists"
"Extended language features for specifying integration rules"
"Benefit of Hierarchical Connectors to Design and Deployment of Automotive Software"